The Muskegon River is a tailwater fishery, which means the river water actually comes from below the dam. Even during the coldest of air tempratures, (Proven last winter) The Muskegon never freezes and provides outstanding fishing oppertunies during the winter months. Trout and Steelhead abound during the winter months and the river is alive with aquatic insect larvae, and salmon fry throughout the winter, allowing fish to feed during the cold months. As other rivers like Pere Marquette, White, and Big Manistee. The Muskegon has very good fishing in the upper sections all winter long. BGS FaceBook Page – more fishing updates. JoJo with a very respectable Steelhead taken on a peach psycho nymph. Steelhead fishing was very good today with a warm up in the weather. Misty with one of several very nice Brown Trout. We had a great day on the water today. Weather was finally nicer today, lower 40’s felt wonderful! 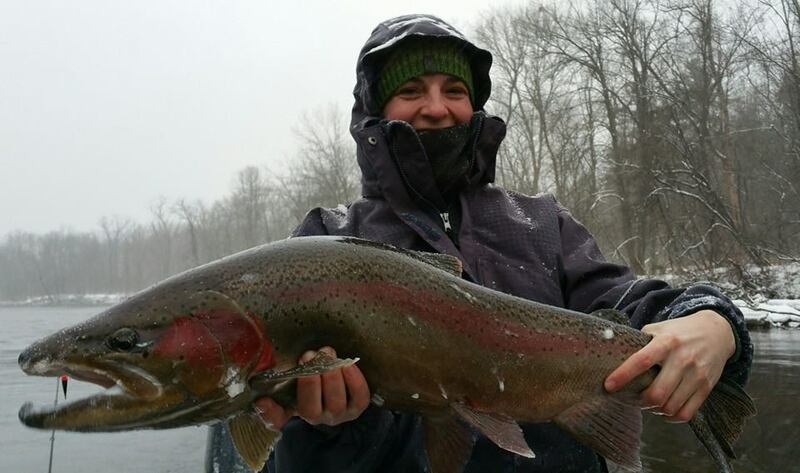 Jo Jo and Misty had a great day on the water and landed a bunch of steelhead, and some very nice trout! We fly fished today and the steelhead were all landed of different nymphs, the trout all took egg patterns. Water level is at 1870 cfs, and is very clear, hovering at 34 degrees. We should expect some very good fishing coming up with the projected warmer weather. Steelhead fishing should remain good. (1/17) Steelhead fishing has been very good on the days when it’s warmed up a bit. Water levels have been perfect, flowing at 1750 cfs. Good wading conditions, crystal clear water. Also offering some great trout nymphing on light rods. A good mix of Steelhead, and fat and sassy Muskegon River Trout. I’ve had the great pleasure of centerpin float fishing with Dan and Tim for the past 7 days. We’ve certainly worked for fish over the last week but have definitely brought some great steelhead to the net. Pictured below are our four largest Steelhead. We’ve averaged 5-6 Steelhead per day, and many, many trout. We’ve fished all sections of the river. Having our best luck in the middle to lower sections. Water levels have fluctuated often over the past week but is now a perfect level. 2800 cfs and very clear, 4′- 5′ of visibility. Fishing Has been very good over the past week or so. Good numbers of steelhead throughout the system with perfect water conditions. Middle sections of the Muskegon seem to be fishing the best but, no real concentrations of steelhead. The entire river has been fishing pretty well. Averaging about one steelhead per hour with various techniques, floats and spawn producing the most fish. Fly Fishing has also been productive with the recent, slightly higher water levels. Peach egg flies and salmon fry patterns seem to be fishing the best. Plenty of trout on nymphs and stone flies.